Proper care of our teeth is essential to maintaining good oral health and a beautiful smile throughout our lives. Though we’ve all been raised being taught proper care by our parents, dentists, and even presentations at our school, many people fail to practice proper dental hygiene resulting in decay, infection, and gum disease. If it’s been long enough that you’re uncertain how to properly brush your teeth, we’ve provided a refresher below. Plaque Removal: If you’re trying to remove plaque efficiently, a soft-bristled toothbrush is going to be your go-to tool. Narrow Gaps: If your teeth have narrow gaps or difficult to reach areas, you need to get your hands on a toothbrush with a narrow head. One final note, if you find yourself inclined to use hard-bristled toothbrushes, you should consult with your dentist. Firm or hard bristled toothbrushes are becoming more and more difficult to find due to the detrimental effect they’ve been found to have on dental teeth. The hard bristles can erode away enamel quickly, and are actually responsible for many cases of “traumatic tooth brushing” which damage the teeth and gums. Angle Of Attack Matters: Many of us brush our teeth at a flat angle, 90 degrees to the tooth. Proper tooth brushing requires a 45-degree angle to remove plaque and food debris efficiently. 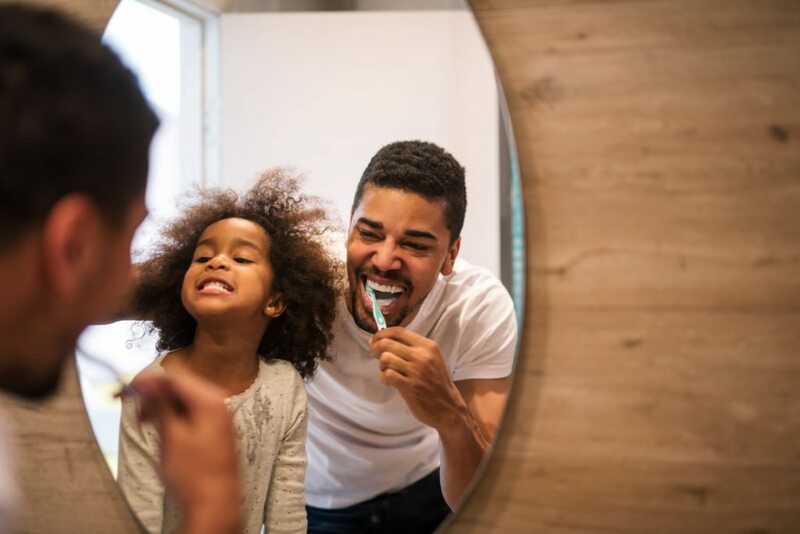 Take Your Time: A full two minutes should be devoted to brushing your teeth, any less and you may not be removing all the plaque and debris from your mouth. Be Gentle: There’s no reason to grind at your teeth with your toothbrush, and this can in fact reduce the life of your toothbrush and possibly lead to damage to your teeth. Be Thorough: Include the space under your tongue, the roof of your mouth, and the roof of your tongue in your brushing habits. This will aid in reducing halitosis (bad breath) and remove hidden food particles. Following these four simple guidelines, along with picking the right toothbrush and a consistent flossing and mouthwash routine will aid in keeping your teeth healthy for years to come. With proper care, you can have a healthy, beautiful smile well into your elderly years, without the need for fillings or dentures. Additionally, proper oral care has been shown to have a correlation with overall bodily health, indicating that poor oral health may, in fact, have a systemic effect. Keep your mouth, and your body healthy by practicing proper oral hygiene.